Steve Kalmbach has been involved in the boiler repair, maintenance, and service industry for 40 years. His company, Kasco, has been in operation for 28 years and has a National Board R Certificate of Authorization for repairs and alterations and an ASME S Certificate of Authorization controlled by their office in Golden, Colorado. Boiler inspectors, operators, and technicians have all seen them: secondary low-water fuel cutoff probes – the small box on top of a boiler with a probe extending into the boiler. The conduit leads down to a box with indicator lights and Test/Reset buttons. The Test button is pushed when the boiler is firing and the burner shuts down. Reset is pushed and the boiler operates again. These are conductance-actuated controls. Conductance is an electrical term indicating how well electrical current moves through material. Material can be metallic or liquid, such as boiler water. After a current-sensing device senses current, it activates a set of relay contacts to allow operation of the burner. Unfortunately, most probe controllers cannot distinguish between: 1) current flow through boiler water; 2) a probe with a high resistance-to-ground short, or a short-to-ground equal to or less than the boiler water resistance; or 3) a direct short. For probe installations using a wire for the probe and a separate single wire for the grounding connection at the probe holder, the simple mistake of misconnecting (or reverse connecting) the wires will cause the control to fail in an unsafe condition. In this case, the control will give a permissive signal to the burner without any water in the boiler. If some of the probe wiring does not have a high enough temperature rating for its location, it may affect the insulating capabilities of the wiring if the wiring is in contact with the hot boiler. And if the insulation is breached and has a resistance-to-ground equal to or less than the boiler water, the control will also sense this as current flow. A crack in the probe insulator or scale build-up between the probe and other conductive materials, such as boiler internals or piping, will also allow current flow. 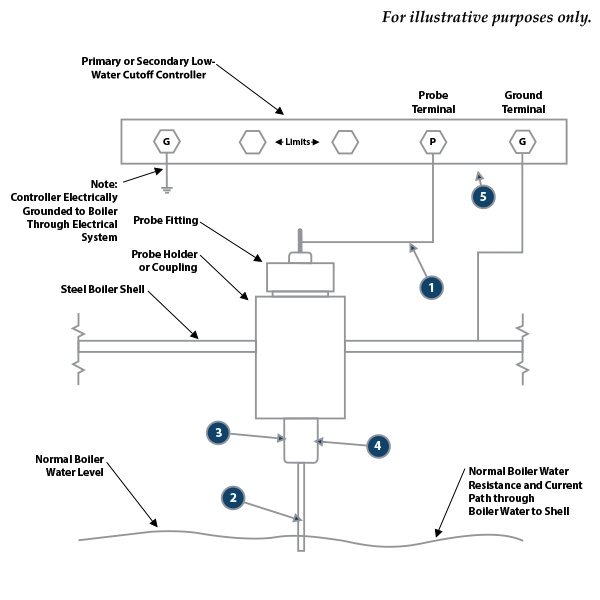 The ASME CSD-1 code, Controls and Safety Devices for Automatically Fired Boilers, and the National Board Inspection Code, Part 1, Installation, require a low-water fuel cutoff. Low-water fuel cutoffs are usually mounted to the boiler externally, making them easily tested. These codes may require a second low-water fuel cutoff, but they do not specify whether it is internally or externally mounted. CSD-1 requires that “each cutoff device shall be installed to prevent startup and cutoff the boiler fuel or energy supply automatically when the surface of the water falls to a level not lower than the lowest visible part of the gage glass.” Boilers shall not be operated when the water level is not visible in the gage glass. For steam boilers, a daily test of the low-water fuel cutoff device is recommended by CSD-1, which also recommends performing a semiannual slow drain test of the low-water fuel cutoff device. Performing a slow drain test requires caution as the primary low-water fuel cutoff must be jumpered to allow the burner to continue firing after the water level is lowered below the primary low-water fuel cutoff. This normally requires two technicians for close monitoring of the water level so the boiler is not placed in an unsafe condition. This also requires close monitoring of the water level, as the secondary low-water trip point may be below the lowest visible part of the gage. Caution must also be exercised at conclusion of the test to confirm any jumpers installed are removed and the system is functioning properly and safely. Most boiler manufacturers simply install a coupling at the top of the boiler shell for probe holder installation. There is no way to check operation of this control without doing a boiler draw-down test under load. If the probe is shorted or incorrectly wired, using the Test button will not prove conclusively that a probe is functioning properly and safely. An external chamber can be used for the probe instead. In this application, the external chamber allows for easier testing. Disconnect probe and ground wire at controller. Without any water contacting the probe, check resistance-to-ground of each wire. Remove probe and check for any unusual conditions, such as scale or cracked insulators. Perform yearly testing and functionality tests of all probes under normal operating conditions. If secondary low-water fuel cutoff is mounted externally in a water column, a daily blowdown test should be performed to check control operation. To verify that testing of the controls causes a master fuel trip, primary and secondary low-water fuel cutoffs should be tested while burner is operating. Visually check during the annual inspection to confirm probe is not mechanically touching the ground or another probe. Visually check probe wiring for damaged or heat-affected wiring. Be cautious using the same type of control for both primary and secondary low-water fuel cutoffs. The same principle of failure can apply to identical types of controls. Mount secondary low-water fuel cutoff externally so it can be checked. Blowdown under load to verify operation. Use of a secondary low-water fuel cutoff with two probes, each probe isolated from ground, will greatly reduce unsafe failures. Use a single probe low-water fuel cutoff assembly with both the probe and ground circuits isolated from the building and boiler grounding system. Resistance or short-to-ground of any probe wiring equal to or less than boiler water resistance. Short-to-ground of probe such as touching metallic internals of the boiler. Shorting of probe insulator to ground from damage or boiler scale. Shorting of probe insulator to probe. Interchanging of probe wire and ground wire at controller. Note: If any of the above conditions exist and the resistance is less than or equal to the normal boiler water resistance, there will be current flow even in the absence of boiler water.